An artefact marking a turning point in Russian history – the proclamation of the 1917 October Revolution by Vladimir Lenin – will be shown for the first time in the UK, the Independent reports. The event marks the uprising’s 100th anniversary. The poster, proclaiming the overthrow of the provisional Russian government, was put up on walls in Petrograd (Saint Petersburg) on November 7, 1917 (October 25 in the old Russian calendar). It was written by Lenin and published in the name of Petrograd Revolution Committee. The historic document, ‘To the citizens of Russia,’ declared that “the provisional government has been deposed,” and announced that power was now in the hands of the revolutionary committee as well as the workers and soldiers. “Long live the revolution of workers, soldiers and peasants!” it proclaimed. The document, believed to be the only one in a public collection in the UK, will be showcased at the Tate Modern next week as part of the gallery’s Red Star over Russia exhibition, according to The Independent. 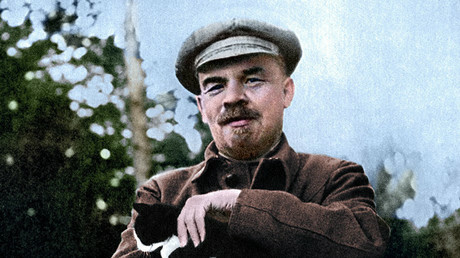 November 7 marks 100 years since the Russian Revolution in which the Bolsheviks overthrew the provisional government. This was the second revolution in 1917, the previous one forcing Tsar Nicholas II from the throne. When the monarchy was overthrown following the February Revolution and the Russian Empire ceased to exist, a Provisional Government headed by Alexander Kerensky was formed. Kerensky, a lawyer by trade, lost power to the Bolsheviks just months later and was forced to spend the remainder of his life in exile, in Paris and New York. To plunge into those turbulent events, check out the hashtag #1917LIVE on Twitter. RT has been running a large-scale historical reenactment featuring the key historical figures, including Lenin and Nicholas II, as though Twitter had existed in their time. Another sought-after poster, also reportedly to be displayed in the exhibition, is one of the first two decrees issued by the Soviet Congress in Petrograd as the October Revolution was gaining momentum. The document proclaimed a decree, lobbied by Lenin, bringing all land and buildings into public ownership in Russia. The Tate purchased both documents from prominent British collector David King, who started his collection of more than 250,000 items (dating from the Russian Revolution to the Khrushchev era) in the 1970s. The exhibition will feature a selection of Soviet posters, prints, photographs, books, and paintings.